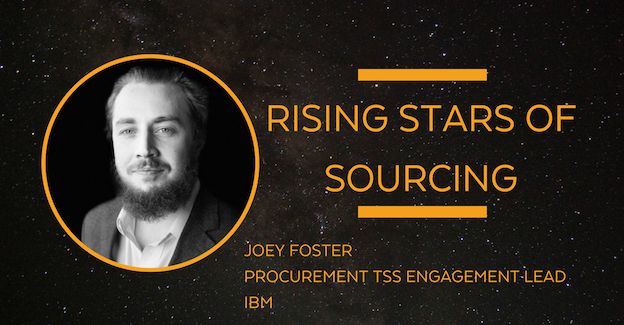 Future of Sourcing Digital's series, “Rising Stars of Sourcing,” recognizes individuals newer to the industry whose thought leadership and expertise have shown promise that is likely to have a lasting impact on the industry. We are thrilled to feature Joey Foster this week, of IBM. My interest in sourcing sparked while studying Supply Chain Management at Michigan State University. Having just finished the introductory course on procurement, I began searching for internship opportunities focused on strategic sourcing. I was offered the opportunity to intern with Logitech’s Global Procurement Team in the Spring of 2015, so I packed my bags and headed to the beautiful Bay Area. During my internship, I primarily interacted with Large Server/Storage OEMs and internal stakeholders to drive impactful changes in supplier management and assorted procurement policies. The relationships established, and experiences gained at Logitech solidified my decision to pursue a career in sourcing! In 2016, I met with IBM while attending MSU’s annual Supply Chain Career Fair and was hired on to the U.S. IT Products Service and Maintenance Team. Because technology has always been a passion of mine, I was and continue to be grateful to work for an innovative company like IBM. So, although my journey was a bit accidental, I have enjoyed being part of a diverse team with extensive knowledge in the category while having the opportunity to grow in my position! I would have chosen a career path in Marketing or Advertising for a professional sports team. Basketball specifically has always been a passion of mine. I’ve played sports my entire life and continue to play in intramural leagues in my free time. Being surrounded by a group of people collectively passionate about winning is an unmatched experience! I positioned myself to lead cross-functional groups in multiple project settings early in my career. Recently, I have been co-leading a $500M+ project with 25+ IBMers from various business units, including Sales, Finance, Delivery and Procurement. Having exposure to various business units enables me to understand the larger workings of IBM, and most importantly, its opportunities for continuous improvement. In addition to project management, I’ve also assisted in leading IBM Procurement’s transition to an agile work environment. Although the nature of agile is to constantly adapt and improve, I was able to help lay the foundation as an “Agile Champion” for the procurement organization. Throughout the initiative, I became visible to the Senior Executive Leadership team that sponsored the program and was able to build relationships with those who continue to exemplify agile in their day-to-day responsibilities. Absolutely! One of my internal mentors is Abram Mercedes who is a Senior Project Executive supporting IBM’s Global Technology Services (GTS). But my longest mentor relationship is my oldest brother. He is currently a Sales Account Executive at a software company and has a variety of professional experience within the technology space. Mentors are key in being successful, so for that reason, I am constantly establishing new relationships and always on the lookout for new mentors. What motivates me the most is seeing success stories across the world. Whether it is in sourcing, sports or personal connections, I strive to be the best that I can be at all times. IBM is a great company to work for because they are constantly setting the industry standard! For the first three years of my career, I specialized in sourcing hardware maintenance. In 2019, I’d like to be exposed to new areas in technology and hopefully gain experience in sourcing other categories as well. Outside of work, I also plan on becoming more active in professional groups such as SIG! Data Analytics. This is the topic constantly being discussed at the executive level within IBM as well as across the industry. There is incredible value from not only analyzing data, but most importantly, creating actionable insights from data. These insights show teams their trends and pain-points, and also show where and how to most impactfully improve. The largest disruptor I see that will continue to be improved upon is Robotic Process Automation (RPA). Almost everything requires some sort of labor force and with technology continuing to improve, RPA is an optimal alternative. Of course, RPA won’t likely take over the labor force, but I’m sure companies will begin to incorporate this as much as possible, blending RPA solutions with human labor. Think strategically. Begin with a smaller concept and immediately focus on how to scale or grow the idea. All commodities and/or categories have their own nuances, but once you understand the general concept of procurement, specifically the sourcing process, you can create a strategy for almost anything! I encourage all those new to the profession to be open-minded when approached with new categories or areas in the business. It’s important to have a diverse skill set and project exposure. Lastly, even if you’re introduced to an unfamiliar area, embrace the challenge and use your network! Joey Foster joined IBM Procurement in June 2016 after graduating from Michigan State University with a degree in Supply Chain Management. He joined IBM's Technology Products Sourcing team supporting the Hardware Maintenance category working with Third Party Maintenance Providers (TPM) and Original Equipment Manufactures (OEM). In 2017, he assisted in transforming IBM Procurement into an agile work environment, helping introduce practices such as standup meetings, iteration planning sessions, and retrospectives. In 2018 Joey too the role of of Technology Support Services (TSS) Procurement Engagement Lead. Still working in IBM's Procurement Organization, however now working closely with senior members of the TSS team and supporting larger engagement that IBM is involved in.